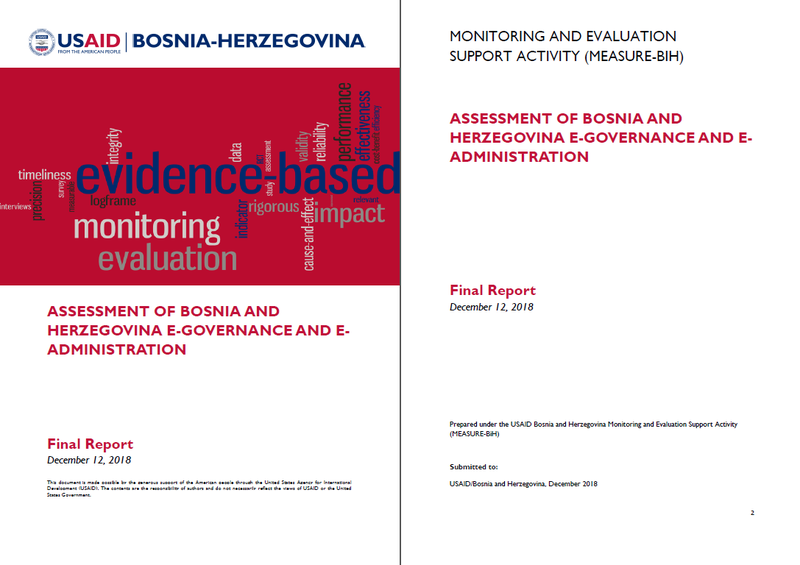 The BiH E-Governance and E-Administration Assessment was conducted by MEASURE-BiH. This assessment of BiH’s e-governance status covers the following assessment topics: (1) the current context under which the public administration of BiH provides e-services to citizens and the business community, (2) the most pressing issues in e-governance, (3) the ongoing or planned interventions of other stakeholders, and (4) the current gaps and needs for further technical assistance. The assessment also provides recommendations to the USAID Mission for further programming in e-governance and provision of e-services to assist citizens and businesses in BiH. What is the present e-governance/e-administration and e-signature situation in BiH? Specifically, what is the current status of legal, regulatory, and institutional frameworks; availability of information technologies; registry of public services and public administration processes planned for digitization and use of an e-signature platform; policies and plans for digitization; e-governance implementation; and establishment of an e-signature platform? What are the gaps in the above-mentioned areas, and what resources and time frame are needed to address these gaps in order to create the necessary and sufficient preconditions for e-governance/e-administration implementation and establishment of a functional e-signature platform? What services and public administration processes, if any, are already digitized through the use of an e-signature platform? What examples of best practices could be used to reduce corruption and rent-seeking behavior of public officials and to improve services and public administration processes by reducing time and cost and simplifying procedures? What recent and ongoing interventions using e-governance and e-signatures to fight corruption have been implemented by BiH government institutions and major bilateral and multilateral international donors? 4. Which three to five sectors, and which public administration services/ processes provided to citizens within these three to five sectors, could be digitized through an e-signature platform to produce the most immediate effect in addressing corruption and rent-seeking behavior of public officials, improve the transparency of the work of the public administration, and reduce the time and cost of accessing and acquiring these services by citizens? 5. Which three to five sectors, and which specific services and public administration services/ processes provided to businesses within these three to five sectors, could be digitized through an e-signature platform to produce the most immediate effect in addressing corruption and rent-seeking behavior of public officials, improve transparency of the work of the public administration, and reduce the time and cost of accessing and acquiring these services by businesses? The assessment team used a mixed-methods approach based on an extensive desk review of relevant reports from international organizations and of local government documentation, focus groups with representatives of the business community, a mini-survey with private sector companies, and semi-structured interviews with 35 institutions and 70 key informants (KIs).